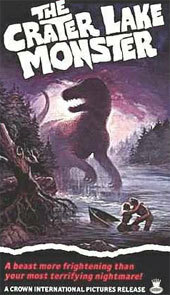 The Crater Lake Monster is a terrible movie about an ancient Dinosaur that is disturbed when a meteor crashes into the lake. Of course that monster starts eating everyone it can get. Looks like a Plesiosaur has hatched when it’s ancient egg was warmed when this meteorite crashed and settled on the bottom of crater lake. A fisherman, and a handful of random people become it’s victims. Scientists, already at the lake studying nearby native cave painting (that of course include a painting of hunters trying to kill an aquatic dinosaur, want to study the creature while the local police officer wants it dead. This movie stars pretty much no one, and the creature is an awkwardly animated beast… There really isn’t a lot going for it. Wow… Why do I like this movie so much? Because it is funny and cheezy in alkl the right ways. Stupid? Oh you better believe it. The Crater Lake Monster is a 1977 B-movie horror filmdirected by William R. Stromberg for Crown International Pictures, and starring Richard Cardella. The script was also written by Stromberg and Cardella, and their affiliation withThe Crater Lake Monster marked the zenith of their careers. The storyline revolves around a giant plesiosaur, akin to theLoch Ness Monster, which appears in Crater Lake, next to a small Oregon town. As people are attacked by the monster, the Sheriff (Cardella) investigates along with a group of scientists in order to stop the creature. The best thing about this movie has to be the stop motion effects of the creature – much better than I expected (but not great in any way shape or form). I freakin’ liked it, but I won’t necessarily suggest it, lest you hate it and blame me. This entry was posted on August 8, 2012 by catfishman. It was filed under Uncategorized and was tagged with animated, bad, campy, Crater lake, creature, dinosaur, funny, horror, loch ness, low budget, meteor, meteorite, monster, silly, stupid, terrible.